Making frequent trips to the library is a good way to get your child involved in the reading process. By getting your child her own library card, you will spark her interest in going to the library to check out books and other reading materials. Have your child make a list. Before hitting the library, encourage your child to make a list of whatever books he wants to read. Summer should be a time for kids to enjoy the reading and have as much fun with it as possible. Explore tech options. Although visiting libraries may seem outdated, many of them now offer many technology options, such as E-books, audio books, and GPS navigation apps to help students quickly find materials within the library. See if your local library offers a summer reading program. Most libraries have programs in the summer for children that include events like puppet shows and presentations from storybook authors. Others may host book clubs for kids of all ages. Programs like these are a great way to get your child excited about reading. Read aloud. Kids love interactive reading sessions. Reading out loud can help them sharpen their fluency and comprehension while increasing their vocabulary. Find reading spots. If your child gets bored easily, it may be a good idea to switch up their reading spots regularly. You can try reading with them in the backyard, on the front porch, or in a park. Connect books to summer experiences. If you go somewhere on vacation, choose some books that have a similar setting. If you take them to a special place, choose some books that have related materials, like stories that have a lot of animals if you went to the zoo. 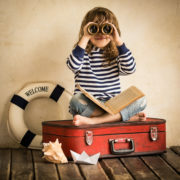 When a child is able to connect what they read in a book with the places that they go and the things that they see in real life, they will most likely have more meaningful experiences. Create a reader-friendly environment. Make sure you have a lot of reading materials lying throughout your house. It could be anything from newspapers and magazines to brochures and pamphlets. The more access they have to these materials, the more opportunities they have to pick them up and start reading. Download digital reading tools. If your child prefers to read digitally, don’t discourage him. Find apps that he can use to read and support his interests. Some of these apps even include games that improve reading comprehension. Set an example. Your kids look up to you as role models and if they see that you make reading a priority in your life, they will most likely want to make it an important part of theirs too. Communicate. Ask questions about the books they read. Who is their favorite character? Why do you think the character did that? What did you like about the story? What didn’t you like about it? This will get your children to think critically. At Cranium Academy, we make it our goal to inspire each child to think both critically and creatively. We believe that one of the best ways to achieve this goal is through the power of reading. We stress the importance of reading not just because it supports a child’s cognitive development, but also because it can broaden your child’s understanding of the world.